Last time I remember, we all were pranked by someone that Ed Sheeran was coming to India. That was a hoax created but this time the news is 100% true. While it will be pointless to say that his website has the dates of his show in India, in this blog I will talk more about his reason for coming to India. While the tickets prices for India are not yet declared, be very sure the ticket prices will cost something around 15-20k. The 26-year old star released the song ‘Shape of You’ this year in January. It ranks 1 in the Billboard Hot 100 tracks and it boasts twice as many points as "Bad and Boujee" by Migos featuring Lil Uzi Vert that ranks 2nd in the chart. In the last few months, we had seen Coldplay and Justin Bieber perform in India. India has become a favourite destination for international artists as India has a huge fan base for artists like Ed Sheeran. It is guaranteed that Ed Sheeran always gets the love of the Indian fans. So this time it is Ed Sheeran to reciprocate the love that he gets from Indian fans. Awesome reason indeed. But this is not the only reason that brings Ed Sheeran to India. Before Coldplay, and Bieber there were many bands and artists like Metallica, Megadeth and Bryan Adams who toured India. Also, YouTube plays a very big role to make western music famous in India. Now Indians take a lot of interest in genres of music like rock, metal, and rap music, however, Ed Sheeran's genre is pop and folk pop. Now that you already know about the dates he will be performing in India here is the list of things that you may not be knowing about Ed Sheeran. #1. Ed Sheeran names his guitars This might amuse you but some of the names of his guitars are Lloyd, Felix, Cyril, Trevor, Keith, Nigel and the most amazing one James the second. #3. He has planned to take up New Zealand Citizenship Well, the reason is as much funny. If WWIII breaks out no one will be bothered come that far to invade. Good sense of humour lad! #4. He left his home at the age of 16 and lived in the streets of London. For a week he stayed on the Circle Line. He would finish gigs, stay up drinking into the early hours and wait until 5 AM for the tube to open. #5. He also lived outside the Buckingham Palace. In the winters to keep himself warm, Sheeran lived in the stone archway fitted with a heating vent. Ironically 3 years later he was inside Buckingham Palace playing for the queen at her Diamond Jubilee party. Ed Sheeran's concert is to be scheduled in Mumbai on 11th November 2017. 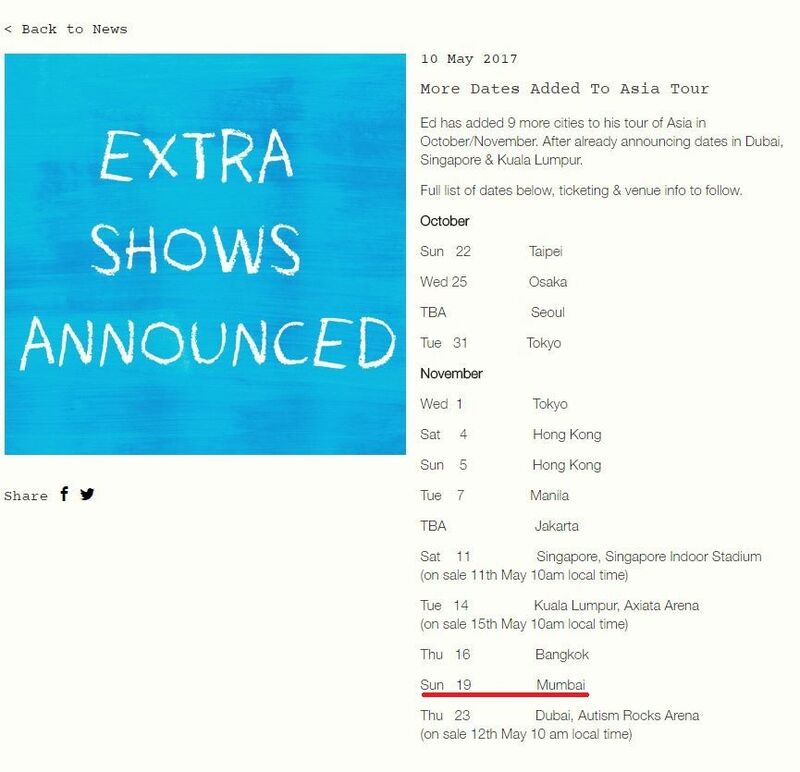 Here is the schedule of Ed Sheeran’s tour in the upcoming months.